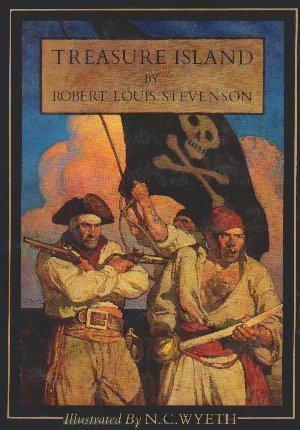 Robert Louis Stevenson (1850-1894) saw Treasure Island published in 1883. For more on Stevenson's short life and his eventual death and enshrined resting place atop a South Seas island, please click on the "Previous" link at the bottom of this page. 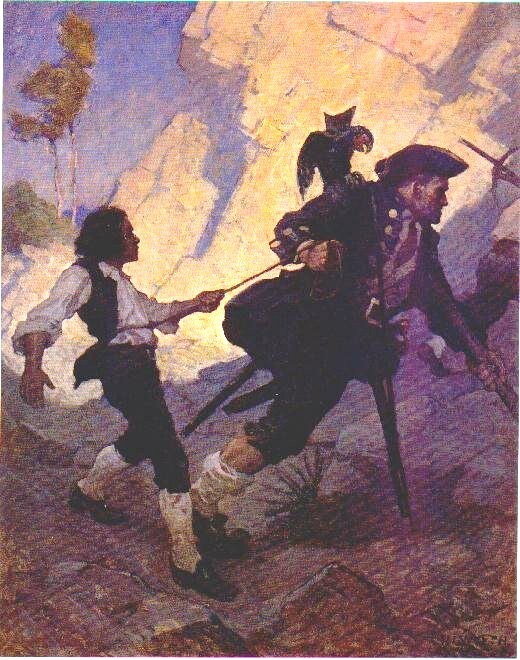 The response to this previous Stevenson Old Time Radio episode adapted from his short story "The Bottle Imp," has proved so popular in the week since we presented it, that we thought his fans would also enjoy a full-blown tale of one-legged pirates, jewels, gold, buried treasure, and murder aplenty with this hour-long adaptation of Treasure Island. "Treasure Island" aired on July 18, 1938, as the second episode of Orson Welles' The Mercury Theatre on the Air. The reason for the "on the air," being that in 1937 Welles' and renowned actor John Houseman began The Mercury Theatre as a theatrical company. When CBS was in the market to host a summer replacement show for the popular Lux Radio Theater, it signed Welles and Houseman to a nine-week contract to fill the summer hiatus. Thus, the CBS Mercury Theatre was born, though it was soon known only as The Mercury Theatre on the Air. Its first hour-long episode was "Dracula" with the second being this Houseman-scripted adaptation of Treasure Island. While critics loved the show, popular response was not great (much like today with summer television ratings; people are more prone to outdoor activities during the summer months), even though Welles and Houseman would do wonderful adaptations of literary classics such as The Count of Monte Cristo, A Tale of Two Cities, Heart of Darkness, and the aforementioned Dracula, to name but a few. But then lightning struck with the October 30, 1938 broadcast of H. G. Wells' War of the Worlds. It made headlines across the country and the story behind its making is one of legend. With only three episodes left on their summer contract, Welles' adaptation of this classic novel drew attention from a lot of quarters. Not least of which was the Campbell Soup Company, which was looking for a show to sponsor. On December 9, 1938, The Mercury Theatre on the Air was rescued from oblivion and continued under the name of the Campbell Playhouse, where more of these world-famous classics of literature and adventure would be produced. At this time Orson Welles was at the peak of his radio (and screen) career, for between the years 1936 and 1941 he would assume the role of actor, writer, or director (or any combination thereof) in over 100 radio productions. 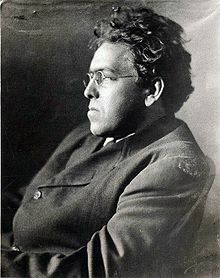 For but two examples within this current series, he starred as Dracula and Dr. Seward in "Dracula," and in "Treasure island" he stars as the infamous pirate Long John Silver and as the (senior) Jim Hawkins, who narrates the tale as an adult; his younger self portrayed by a much younger actor. 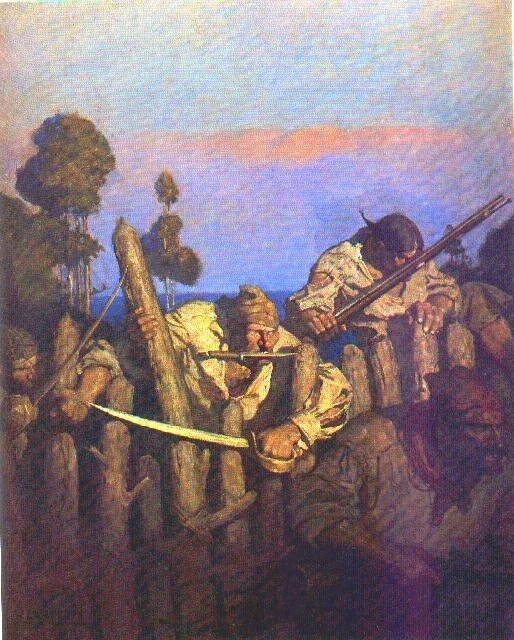 The illustrations shown here are from the 1911 first edition of Treasure Island, lavishly illustrated by one of America's most celebrated artists, N. C. Wyeth (1882-1945, pictured at right, c. 1920). Many consider his work on this book to be perhaps his finest. A final data point: a first edition of the 1883 edition of the book goes for over $32,000. The illustration at top left graces the cover of the book. At upper right we are shown Jim Hawkins, Long John Silver, and his parrot. Illustration at bottom shows the storming of the stockade. With the Memorial Day weekend being extra long, it's fitting that this episode is double the length of the usual half-hour radio drama, as Welles and Houseman well understood when they undertook to dramatize for their listening audience--some 72 years ago--Robert Louis Stevenson's Treasure Island.